Finding the right screw can be a tedious task in of itself. 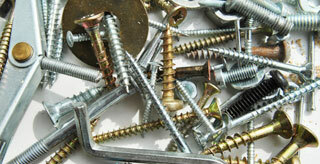 There are dozens of screws types that work in a variety of applications. Learn about the important characteristics of screws, and find out how to choose the right type of screw for the task at hand. As you can see by the names of the most common screws, it’s easy to determine what application to use these screws in. But there are other components that factor into choosing the right screw, including size and length. The size of a screw is extremely important. This determines how much your screw can efficiently hold or anchor. For a safe and accurate application, the screw thickness needs to work for the width of the material you’re placing the screw into, in addition to the weight it will have to support. However, keep in mind it’s not always that simple. If your load is 50 pounds, a screw that can hold 50 pounds will simply not suffice. The tightening of the screw during application needs to be factored into the total load capability, as well. Make sure that the pre-load is at least twice the weight of any external loads to reduce risk. Check the packaging to confirm load capabilities before application. When choosing a screw length it’s important to remember that the nail should always be three times as long as the thickness of the material in which it will be driven into. To find this: hold the screw up against the piece you’re putting it through and select a nail approximately three times the thickness. Although there are several factors to consider when choosing the right screw, it truly depends on the application itself. Just make sure you have the right screwdriver lying around.